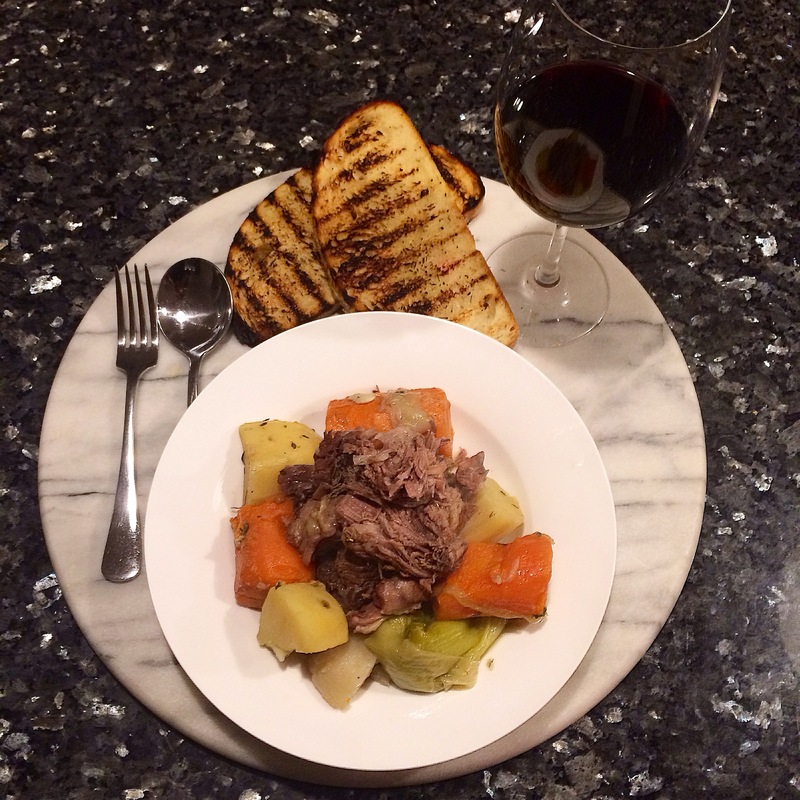 Pot-au-Feu is a prime example that the most basic ingredients, cooked simply but to perfection, can make for the most hearty and satisfying meals. The unromantic could describe it as boiled meats and veg in broth, but the French have had a long affair with the Pot-au-Feu and you’d be hard pressed to find a family table, rich or poor, in France which it hadn’t graced at some point. It’s one of those nostalgic meals that take me back to my childhood, and in this way, Pot-au-Feu seems like comfort food for the body and for the soul. Put the meats in a large cooking pot and cover with water. Place the pot on the stove and bring it to the boil. Once it starts boiling, gently scoop out the foam on the top of the liquid and keep doing so for about five minutes. Add the Bouquets Garnis, garlic, onions, peppercorn, cloves and rock salt. Cover with a lid and simmer for about 1½ hours on low heat. Meanwhile start prepping the rest of your vegetables. Peel the carrots, turnips and potatoes and cut into big chunks (keep the potatoes in water so they don’t oxidize). Chop off the green part of the leek and cut the white part in half. Then add the vegetables to the pot (except the potatoes) and cook for 1 more hour. Add the potatoes and finish off the cooking for 30 minutes. Serving suggestion: Place the meat in the center of a large serving tray and arrange the vegetables around it and serve with a side of Dijon mustard, Cornichons, Fleur de Sel (sea salt flakes) and chargrilled bread! In true peasant food style, waste not, want not! Don’t throw out the beautiful broth that’s left in the pot. Once you’ve removed your veggies and meat from the pot, add some vermicelli egg noodles (or any other soup pasta that you fancy) to the liquid and cook until al dente. Serve this is broth as an entrée before the main event.